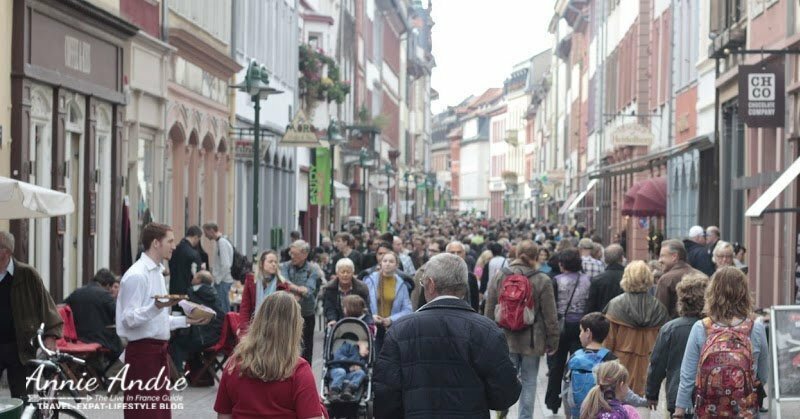 If you love to shop and are planning a trip to France or you’re just curious, here are France’s main shopping streets where shops are thriving thanks to foreigners and French alike who flock to them with open wallets. In case you didn’t know, there’s a retail apocalypse going on in North America—the mass closing of brick-and-mortar retail stores since 2010 like Macy’s, Toys R Us, Ralph Lauren and the list goes on. 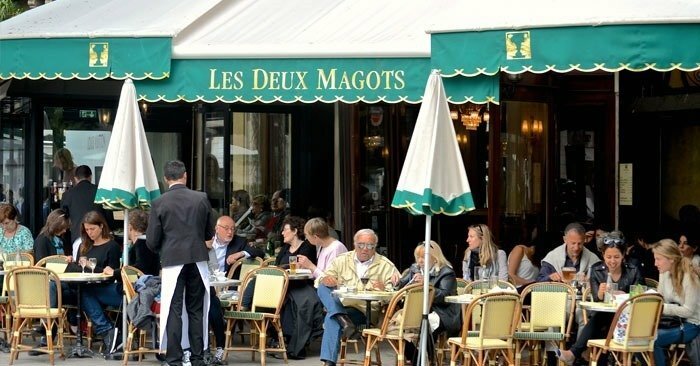 In France however, shops are thriving on French Main streets despite rents costing shop owners a fortune. 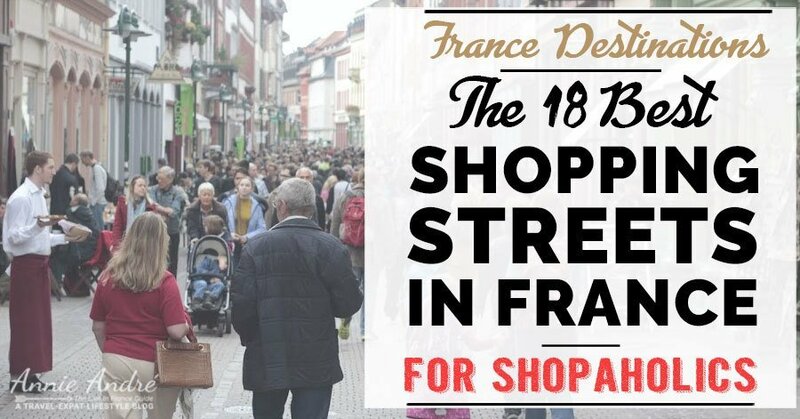 Here is a list of 18 popular shopping streets in France, who according to real-estate accountancy firm Cushman & Wakefield’s 29th edition of “Main Streets Across the World”, also have the highest rents in France. A generic phrase used to describe the principal street, traditionally the site of shops, banks, and other businesses. In the UK the closest equivalent is High street. 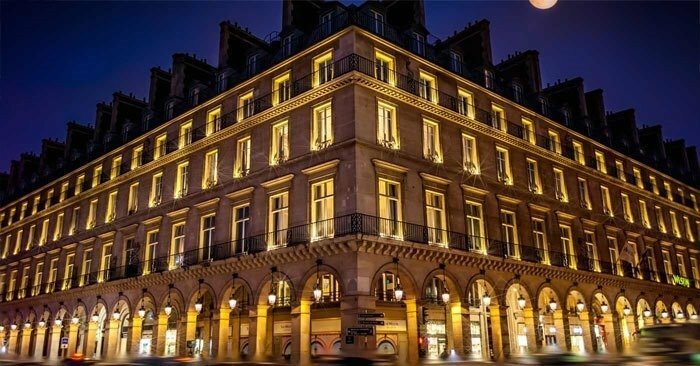 Paris is recognized internationally as one of the world’s most important fashion capitals of the world so it should come as no surprise that 9 of the 18 most visited shopping streets in France are located in central Paris. All within walking distance of each other. Paris, France: €13,255 per sq.m. per year (US $1,407 /sq. ft. / yr.). 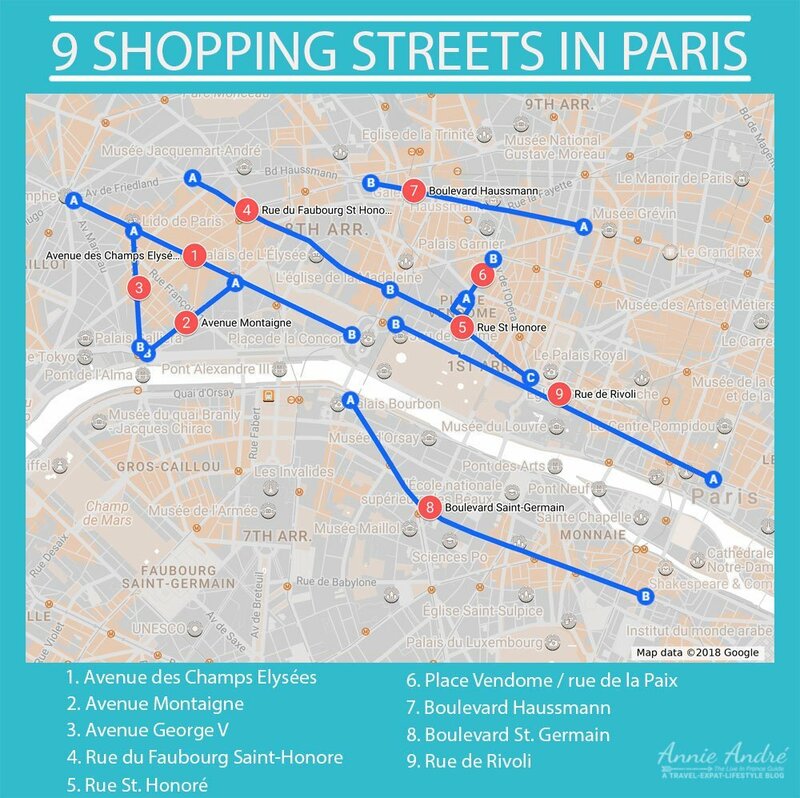 At the top of this list is the world famous Avenue des Champs Elysées. At $1,407 per sq foot per year, a 1,000 sq. 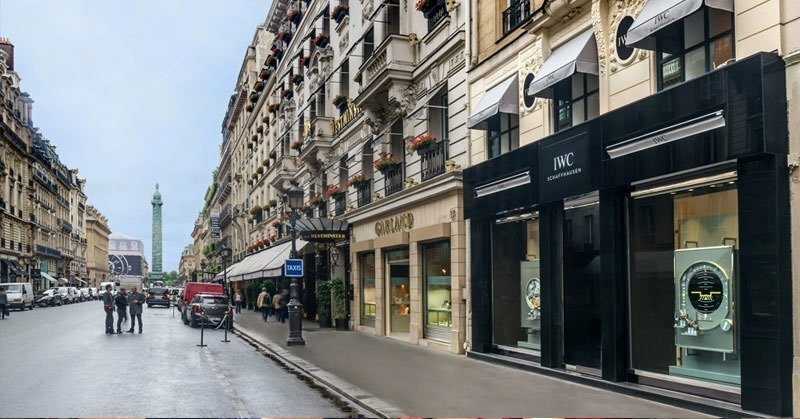 ft. space could cost retailers as much as $1.4 million USD a year making this THE MOST EXPENSIVE stretch of real estate in France. Although it’s possible to stroll the length of this 2km (1.25 miles) avenue which links the world famous Arc de Triomphe on one end to the Place de la Concorde on the other in a single afternoon, it usually takes much longer thanks to the shops and restaurants located up and down this iconic Avenue. Shopping on the Champs Elysées is a mixed bag. As a result of high rents, you’re unlikely to find small, quirky independent shops. Instead, you’ll find a sprinkling of pricey cafés, tourist trap restaurants, travel agencies, banks, main street or high street shops like Disney and Nike and of course luxury flagship stores like Cartier and Louis Vuitton. This is a huge tourist destination and you’ll probably see more tourists than actual French people but it’s still a must see. Paris, France: €9,573 per sq.m. per year (US $1,016 sq. ft. / yr.). 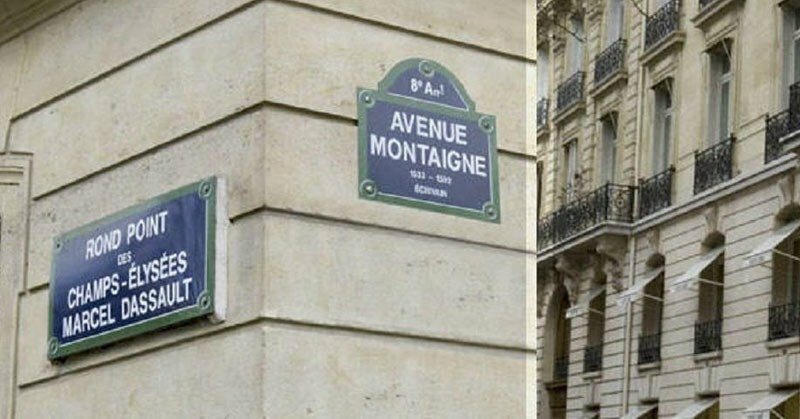 Measuring just 615 metres long (672 yards), Avenue Montaigne is a short little side street off of the world famous Champs-Elysées in Paris France. Plan on doing mostly window shopping unless you’re prepared to spend a lot of money because this little street is home to mainly famous luxury brands. Giorgio Armani, Chanel, Gucci, Givenchy & Dior all have a store here. Paris, France: €2,798 per sq.m. per year (US $297/sq. ft. / yr.). Avenue George V is another short but high-end shopping street located off of the Champs Elysées in Paris. Measuring just 730 metres long (800 yds), it is one of three famous Avenues that make up the coveted GOLDEN TRIANGLE in Paris: 1) Avenue des Champs-Élysées, 2) Avenue Montaigne and 3) Avenue George V.
The Golden Triangle or Triangle d’Or, is a traditionally an upper-crust neighbourhood in the 8th arrondissement known not only for its luxury shopping and upscale cafés but also for its luxury real estate —mainly of apartments and duplexes in prestigious nineteenth-century Haussmannian buildings. Purchasing a luxury apartment within the Golden Triangle is considered a status in itself but it will cost you. 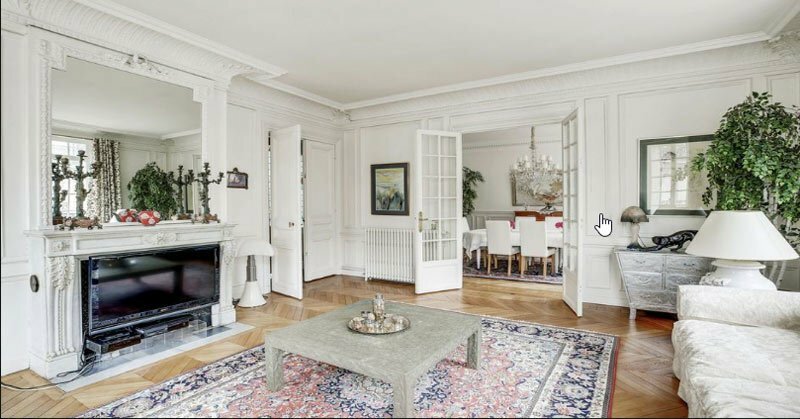 Just to give you an idea, a 2 bedroom, 130 sq meter flat(1,400 sq ft) in the golden triangle, like the one pictured below, can cost as much as 2.6 million euros (over 3 million USD). And to rent a flat similar to this would cost you between 3 to 4 thousand Euros per month. (3,500 to 4,700 USD per month). Paris, France: €9,573 per sq.m. per year (US $1,016 /sq. ft. / yr.). Rue du Faubourg St Honore is a 2 km street that runs parallel to the Champs Elysées. 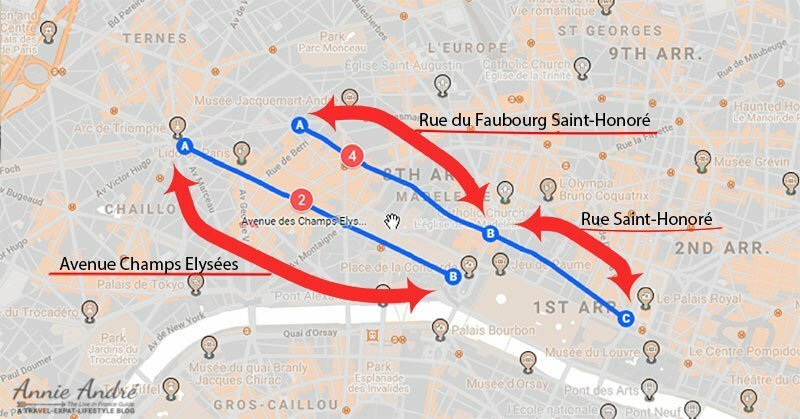 At the 2 km mark, the street continues on but the name changes and drops the “du Faubourg” to become just Rue St Honore. Together the two streets are approximately 4 km long. (see illustration below). 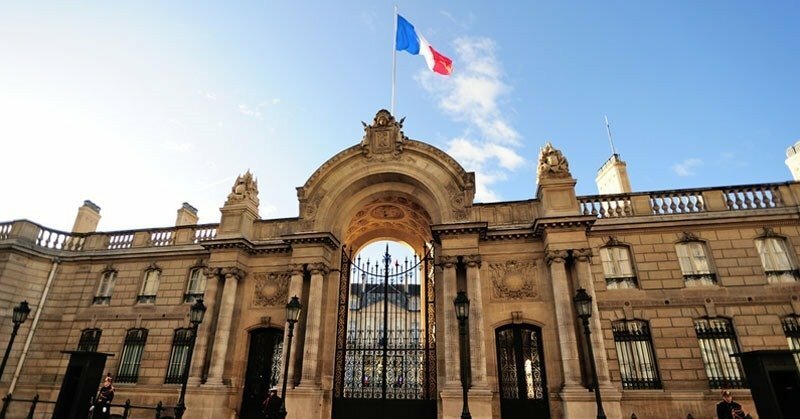 In addition to shopping at some high-end retail shops such as Fabergé et Cie, Chanel, Lanvin and Hermés, the street is also home to quite a few embassies and diplomats including the President of France. AMBASSORDORS: 4 ambassadors to France live on this street in hotels (source) — US, Great Britain, Canada and Japan. RESIDENCE OF THE FRENCH PRESIDENT: Élysée Palace, originally the Hôtel d’Évreux is the official residence of the President of the Republic of France. 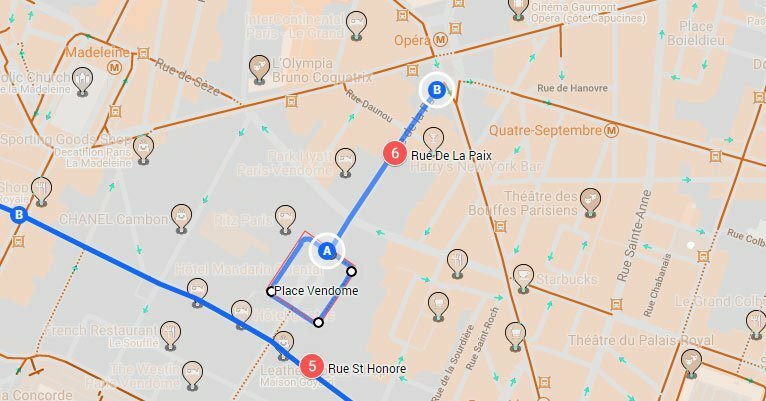 Once you pass Rue Royal on Rue du Faubourg Saint Honoré, the street name changes to just Saint-Honoré. 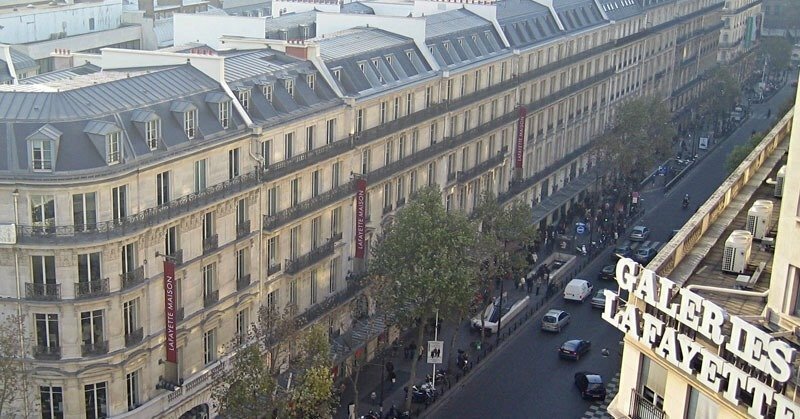 Rue Saint-Honoré is a mecca for shoppers in Paris seeking haute couture, high fashion & luxury items. This is where all the style bloggers and fashion magazine editors do their shopping because it’s so centrally located and has literally every shop imaginable conveniently located in one place. If you’re into cigars, check out “A La Civette”, the oldest cigar shop in the world located at 157 Rue Saint-Honoré. 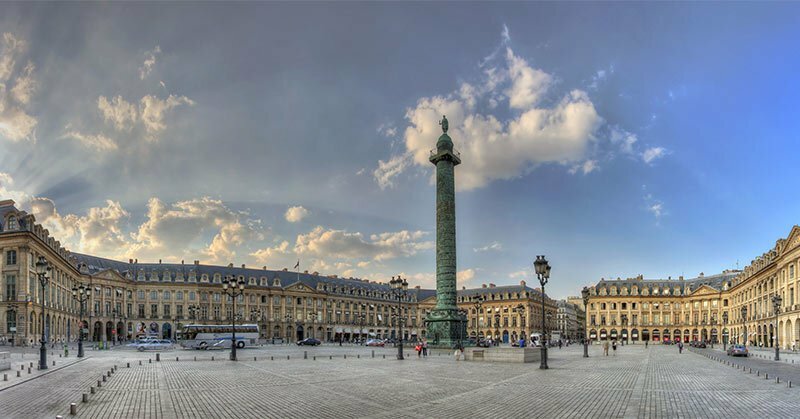 Place Vendôme is a large square located just off of Rue Saint-Honoré where you’ll find a tall (44 meters / 144 ft) bronze column topped with a statue of Napoleon originally built to commemorate Napoleon’s victory at Austerlitz in 1805. The outer perimeter of the square is home to quite a few fashionable and deluxe hotels and shops. 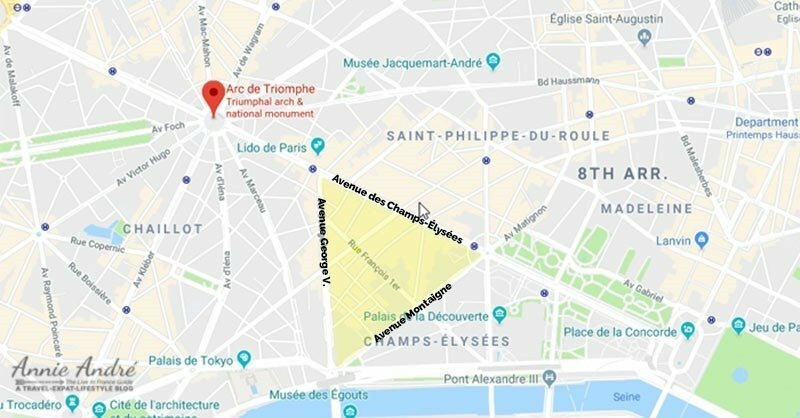 The square is also the starting point of Rue de la Paix, best known for its jewellers, such as Rolex, Cartier, Patek Phillipe, Dior, Van Cleef & Arpels, Fred, and Mellerio etc. Paris, France: €5,891 per sq.m. per year (US $625 sq. ft. / yr.). 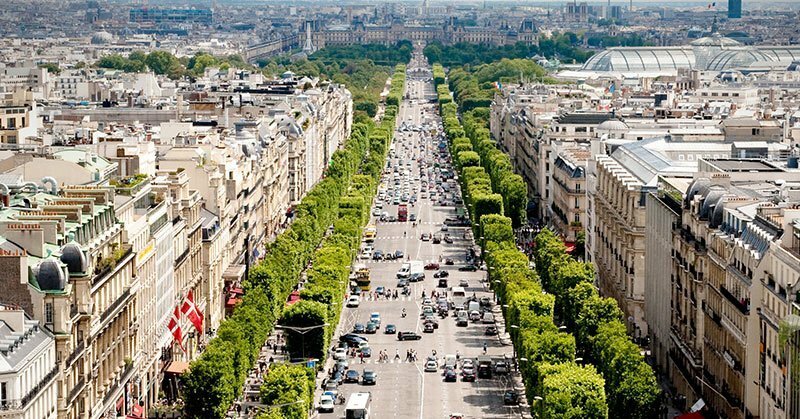 Boulevard Haussmann is a wide tree-lined boulevard, approximately 2.53 kilometres long (1.57 mi) located in the 8th and 9th arrondissement of Paris. The street is mostly lined with Hausman style apartments—the epitome of French elegance and prestige. 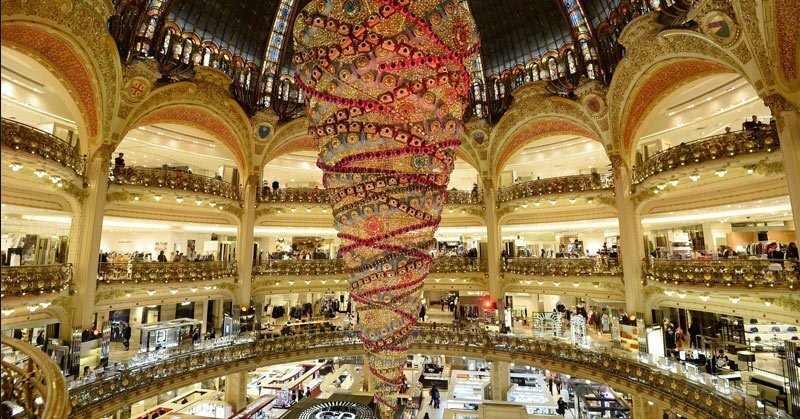 Also located on Boulevard Haussmann are the historic department stores Galeries Lafayette and Printemps. 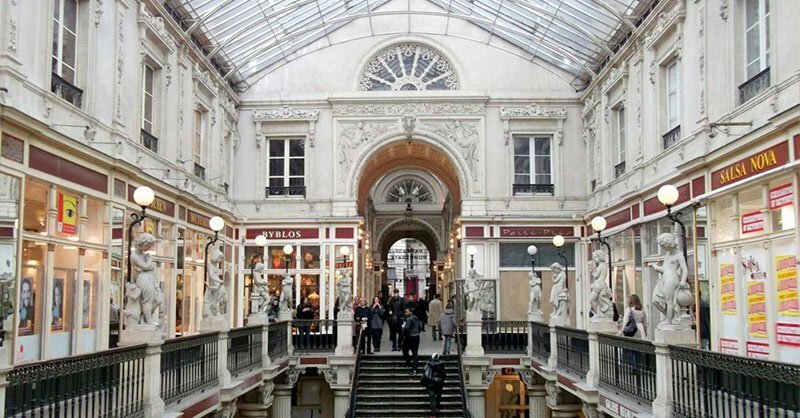 No trip to Paris is complete without ducking into one or both of these beautiful department stores. Paris, France: €4,787 per sq.m. per year (US $508 sq. ft. / yr.). 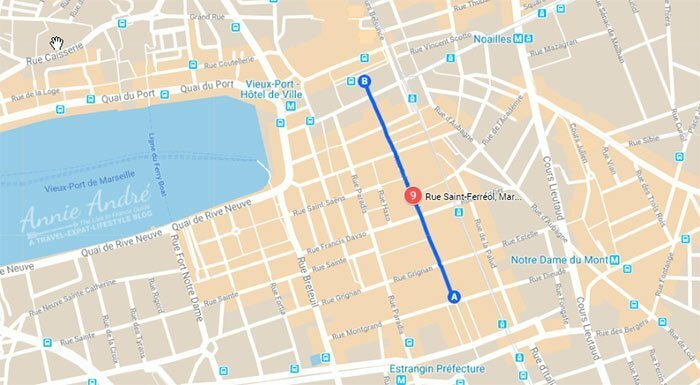 Boulevard St. Germain is a 3 km rd ( 1.7 mi) on the left bank which runs from Pont de Sully to Pont de la Concorde. Always magical, always vibrant and full of energy. Some say stopping off at Boulevard St. Germain is the epitomé of an “authentic French experience”. You’ll find the church St.Germain des Prés, excellent shops and famous restaurants and cafes. Both are now a popular tourist destination and you’ll be lucky to get a table but if you can, it’s great people watching. Pairs, France: €2,577per sq.m. per year (US $274 sq. ft. / yr.). Another famous Parisian street is Rue de Rivoli which runs through the 4th and 1st Arrondissements of Paris on the Right Bank of the Seine. Not as chic as Champs-Elysees but it has a little bit of everything: shops, cafes, restaurants, museums, monuments, gardens, hotels and a few metro stations. It’s also conveniently located a few minutes walk to the Louvre. 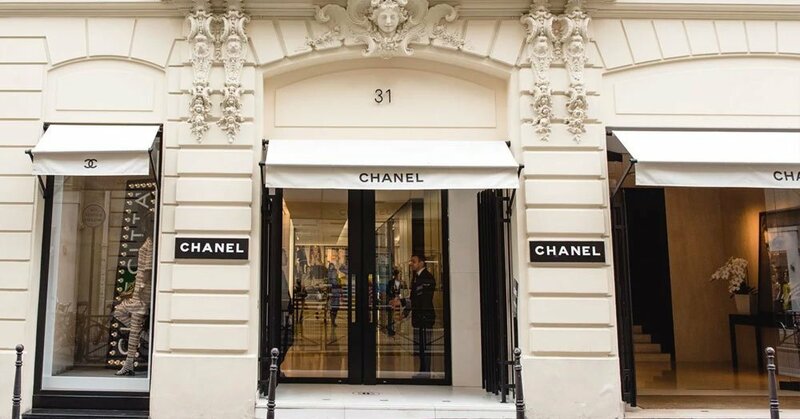 Any trip to Paris should include a walk and window shopping along this famous street. 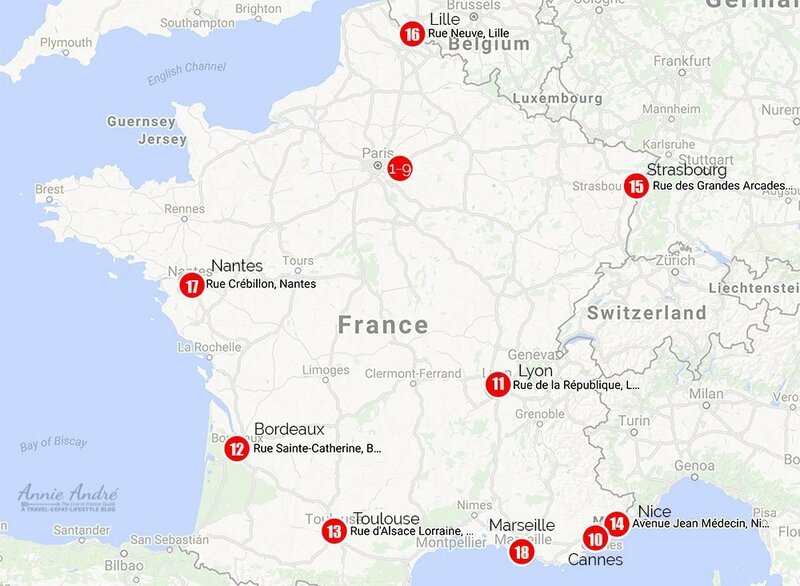 Outside of Paris, there are 9 popular shopping streets throughout France. 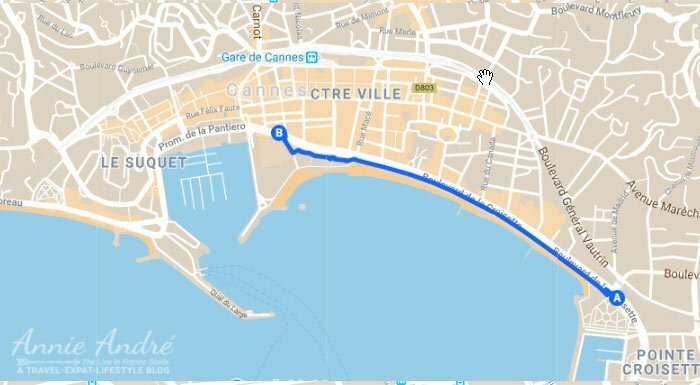 Cannes, France: €5,891 per sq.m. per year (US $625 sq. ft. / yr.). The city of Canne, located 25 minutes from the Nice international airport, is a city of sun, beaches, festivals like the famous Cannes Film festival and of course, it’s a shoppers paradise. Perhaps the most famous shopping street in Nice is La Croisette. A prominent road that stretches approximately 2 km along the Mediterranean sea. 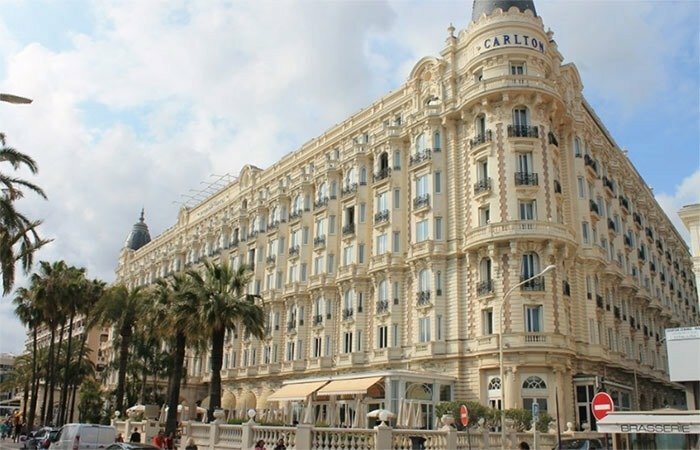 In addition to expensive shops, boutiques and restaurants you’ll also find famous hotels such as the Carlton, Martinez, Majestic and JW Marriott Cannes on La Croisette. 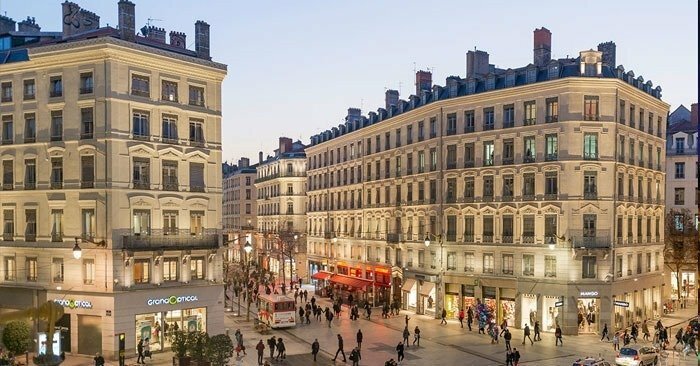 Lyon, France: €1,841sq.m. per year (US $195/sq. ft. / yr.). Lyon has the honour of not only being the culinary capital of France (surprise it’s not Paris), it’s also the 3rd largest city in France. 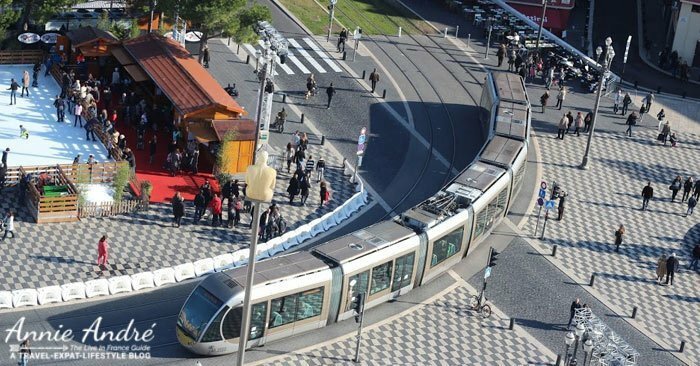 Lyon also has the best public transportation network which includes buses, trams, metros and an extensive bike sharing system which makes getting around Lyon a breeze. 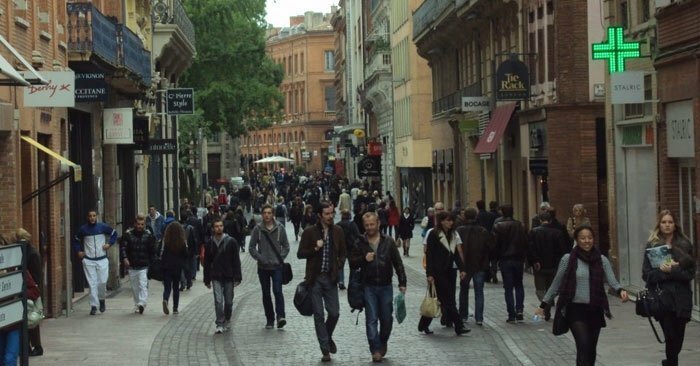 Rue de la Republique is the main shopping street in Lyon which happens to be in a zone classified as a UNESCO World Heritage Site. 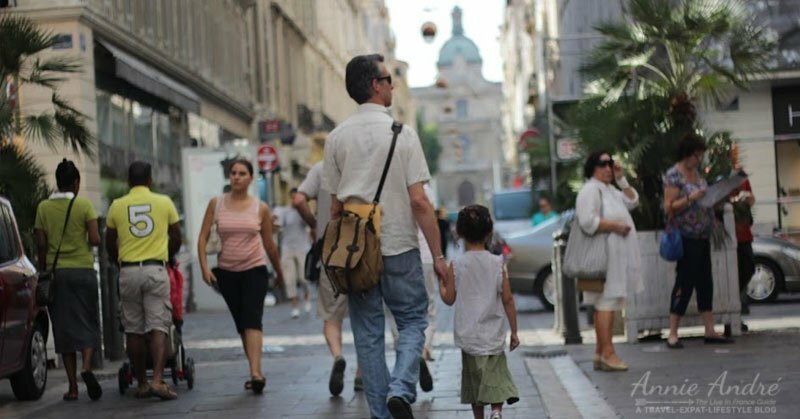 Some even go so far as to say that if you haven’t visited this pedestrian street, you haven’t visited Lyon at all. Bordeaux, France: €1,767sq.m. per year (US $188/sq. ft. / yr.). Bordeaux is the sixth largest city in France in terms of population and is known primarily to the outside world for producing Bordeaux wine but it also has plenty of shopping. Rue St. Catherine, the main shopping street in Bordeaux has plenty of stores catering to the younger trendier market and casual sport type clothing. Toulouse, France: €1,620 sq.m. per year (US $172 /sq. ft. / yr.). The fourth largest city in France is Toulouse, located in the South of France. It’s a fantastic city that is often overlooked by tourists. It’s perhaps best known for it’s food such as Cassoulet and The University of Toulouse, founded in 1229, one of the oldest in Europe. 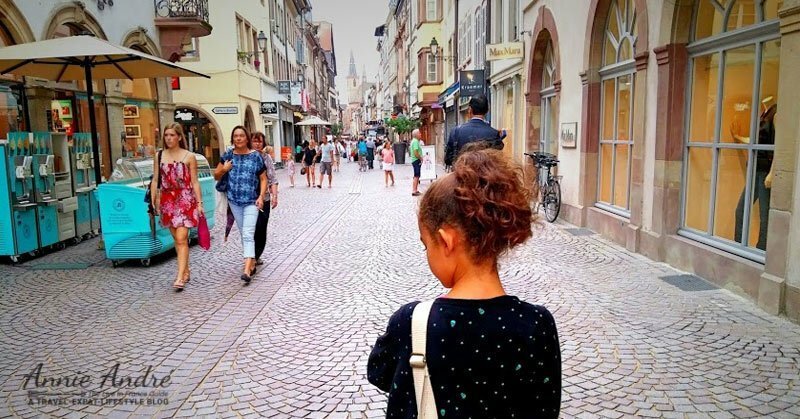 The city also has a very active shopping street, Avenue Alsace Lorraine. Always busy always animated. You could easily spend a few days shopping on this street. Nice, France: €1,620 sq.m. per year (US $172 /sq. ft. / yr.). Nice, located just 30 minutes from the Italian border is a coastal city in the south of France heavily influenced by the Mediterranean culture. Thanks to the proximity of the Nice international airport, it’s also easy to fly in and out of Nice. Every year, tourists and French alike flock to Nice not only for its beautiful beaches and food but also to attend the annual carnival parade in February. In terms of shopping, there’s Avenue Jean Médecin. If you start at Place Massena and walk up Avenue Jean Médecin, the main shopping street in the centre of Nice, known by the locals as “The Avenue”, you’ll find major department stores like Galeries Lafayette and chain stores H&M and Zara. A little further up the street is the main mall which is great to wander through on super hot days. There’s even a Monoprix (supermarket) and a movie theatre (Cinema pathé) located on the street. Strasbourg, France: €1,326 sq.m. per year (US $141/sq. ft. / yr.). Strasbourg, known for its world-famous Christmas market is located close to the German border and as a result, is brimming with both German and French culture in the architecture and the food. Place Kleber is the largest and most well-known square of Strasbourg and Rue des Grandes Arcades is a street that runs alongside Place Kleber. The two together make up a prestigious and historical area of the city where most of the luxury brands have opened up shop. 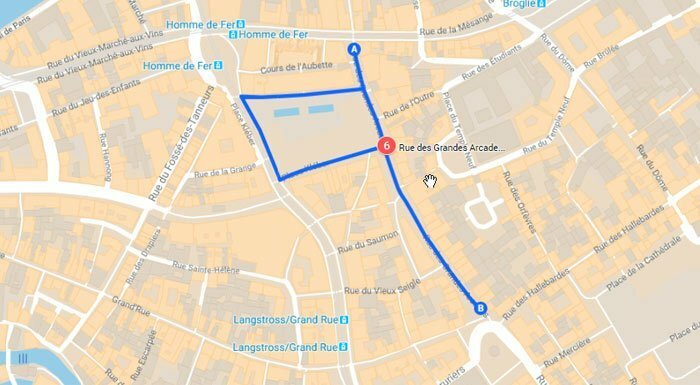 Every Tuesday, Wednesday and Saturday there is a flower market from 9 am to 6 pm on Rue des Grandes Arcades. In the Kleber square on the same day and time, there is an open-air book market where you can peruse used books. Lille, France — €1,326 sq.m. per year (US $141/sq. ft. / yr.). Lille sits close to the border of Belgium, less than a 2-hour train ride north of Paris. Located in the centre of Lille in the old town is Neuve street, a teeny tiny pedestrian street that takes 2 minutes to walk from one end to the other. But size doesn’t matter because although the shopping is limited on this street, there is a large square at one end of the street: La Grande place aka Place Charles de Gaule. The grand place (big square) is a great place to meet friends or family before moving onto shopping, bars, cafes and restaurants in the area. 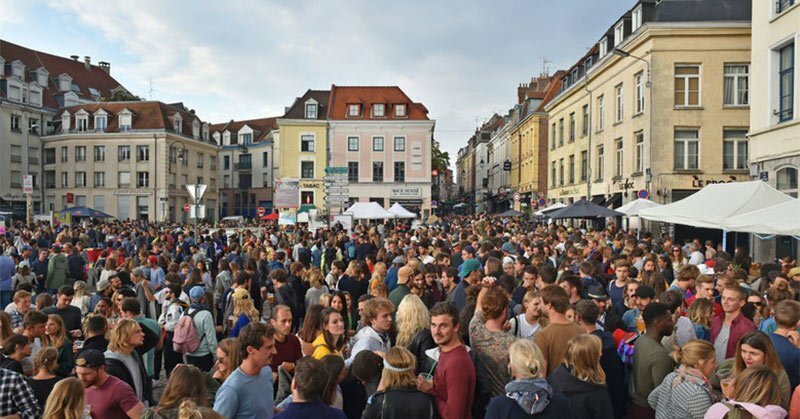 But if you really want to have some fun, be sure to visit Lille during the first weekend of September when the city square and the entire old town comes to life thanks to the annual flea market: GRANDE BRADERIE DE LILLE. The annual Lille flea market is the largest flea market in Europe, boasting 100 km of stalls, 10,000 exhibitors and attracts over 2.5 million visitors. Some say it is the oldest too since traces of the old flea market can be traced back to the 12th century. Nantes, France — €1,178 sq.m. per year (US $125/sq. ft. / yr.). With a population of just under 300,000 inhabitants, Nantes is the 6th largest city in France. It’s located in the west of France on the Loire, 50 km (31 mi) from the Atlantic coast and it’s about a two-hour train ride south-east of Paris making it the perfect day trip excursion out of Paris. In the heart of the city centre of Nantes, between two beautiful squares, Place Royal and Place Graslin, is Nantes’ most famous shopping street — Rue Crébillon. Locals have always loved window shopping on this famous street. So much so, the locals even have their own verb named after the street: crébillonner, coined by Paul Eudel back in 1884(source), which roughly translates to “window shopping”. (The actual word for window shopping for the rest of France is “faire du lèche vitrine” which literally means “window licking”. ) Crebillon street may be the only street in France which has actually generated a verb. Although Crebillon street is short, it’s lined with plenty of chic boutiques, luxury brands, big names in beauty and jewellery, decoration, art galleries, antique shops and more. Marseille, France — €1,031 sq.m. per year (US $109/sq. ft. / yr.). Last but not least is the city of Marseille located in the south of France along the Mediterranean sea. Founded in 600 BC by the Greeks, it’s the second largest French city after Paris in terms of population and at just over 2,600 years old, it’s long been considered the oldest city in all of France. Recent archeological findings now show that Beziers might be a few years older than Marseille. The rue Saint Ferreol is the main shopping street in Marseille located in the centre of the old city just a few minutes from the Old Port. 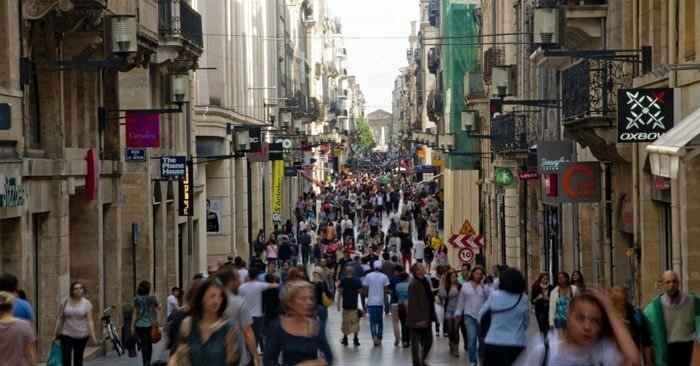 This pedestrian-only street has a mix of small independent shops and a few high-end chains from Galleries Lafayettes & H&M to Pull&Bear & Yves Rocher. The street itself is not very long and should take you less you 10 minutes to walk from one end to the other. When you’re done shopping, take a break and eat at one of the many restaurants along the side streets which can be anything from traditional French bistro to the ever popular Kabab shops. Take some time to admire the charming old buildings and architecture before heading off to some other interesting site.